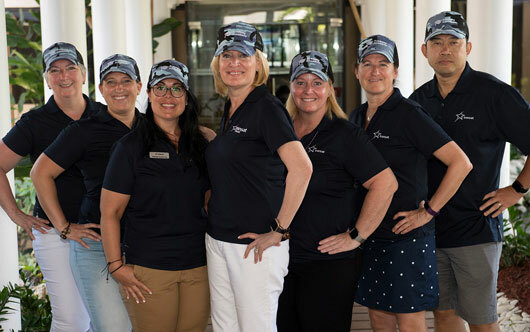 More than 100 agents from across Canada, along with 23 suppliers, recently attended the Transat Distribution Sales Academy, held at the Melia Caribe Tropical in Punta Cana, Dominican Republic. Agents received intensive sales training, along with dedicated training on Sun Destinations, Europe, Cruise and Luxury products from preferred partners and professional coaches. Pictured is the Transat Distribution team of (l-r) Renee Lafontaine, trainer; Julie Bilodeau, recruitment and training manager; Michelle Armstrong, manager, Groups & Special Programs; Susan Bowman, vice-president, Marketing & Industry Relations; Sandra Wesson, director, Product & Industry Relations; France Gauthier, regional manager, Corporate Stores & Groups; Allan Liao, regional manager, Corporate Stores.